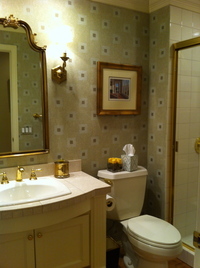 The client objective here was to update this bath and get rid of the brass and gold elements. We decided the glass mosaic was so great that a feature wall would give this update a much needed punch. All the colors were based off of the granite remnant we found. 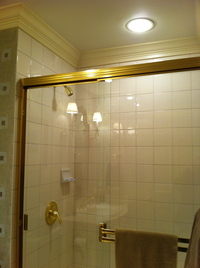 This before picture shows the brass metal frame of the shower door and the small tiles with lots of grout lines. After, what a difference with the frameless shower door and the large format wall tile!